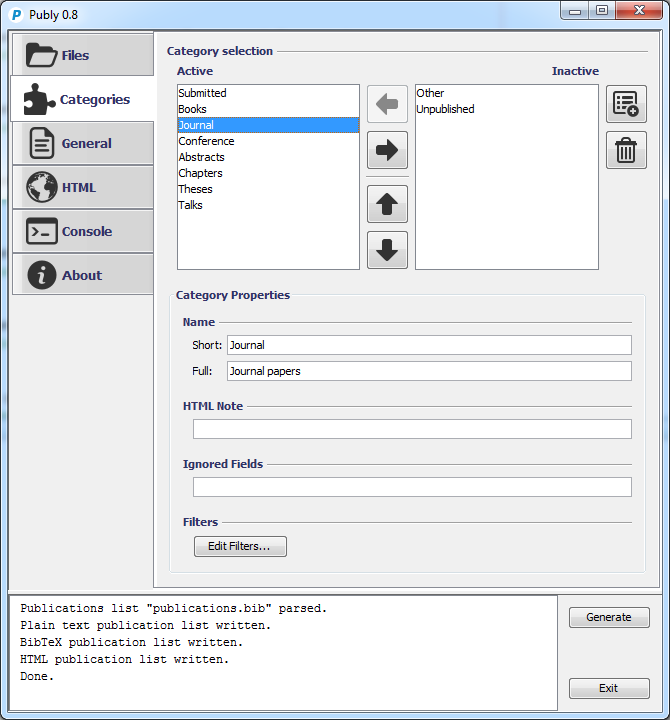 Publy turns a BibTeX file with a list of your publications into a professional webpage. Fast, effortless, and exactly the way you want it. Set up custom categories and filters. Play with the different options to find a format that you like. Look through the example publications list for inspiration. Add author tags for frequent co-authors. Add abbreviation tags for frequent phrases and publication venues. Add additional information to each publication, such as an abstract, DOI, arXiv identifier, or other relevant links. Edit the default CSS style to match the look of your homepage. Publy is written and maintained by Sander Verdonschot. There are many ways you can help! If you are missing a key feature, or notice an annoying bug, add an issues to the issue tracker, or vote if it is already there. If you want to add the feature or fix the bug yourself, just fork Publy, make the changes in your fork and create a pull request.